We’ve hit spring and summer, so today I’m taking a look at ways to integrate Star Wars in new ways throughout the fall and winter months. August sees the biggest shift in programming dynamics within public and school libraries- public libraries see their tweens and teens starting back up with school activities long before school actually starts (band, football, cheerleading, and other activities) and the anticipation builds, while school libraries get their teens and tweens back along with a whole new crowd that is new to their school. The familiarity of the Star Wars characters and culture can become an easy and popular touchstone. August is the best time for school and public librarians to reach out to each other and see what partnerships they can create as well. There are a host of resources that each can offer the other, and everyone is working to serve the same tweens and teens, just in different spheres. A good working partnership between the school district and public library system benefits all sides, and when the librarians and library staff can form working relationships, everyone benefits. Defy Superstition Day: Have a week-long contest for tweens and teens to guess how many times “I have a bad feeling about this” or its variants have been said in the 7 movies. Winner gets a small prize such as a lucky charm of their choice or a keychain light saber. Banned Books Week: For 2016, Banned Books Week is September 26 through October 1. Some of the underlying premises of the Empire are the restrictions it imposes and the heavy hand it uses on the land, which can both go hand-in-hand with the censorship of books. Pull out a display of books with similar themes of restrictions on teens and tweens, mind control, and other ways of controlling thinking and the message. Titles could range from 1984, Feed, and The Lunar Chronicles to The Program and Candor. This is the perfect time to start holding costume design programs! Tweens and teens still love dressing up for Halloween (and don’t tell me you don’t- we just call it “cosplay” or “work related”) and by having a costume creation party tweens and teens can bounce ideas off each other and help each other out if they get stuck. There are plenty of books and websites that can show you how to make cuffs, masks, and other accessories from supplies that libraries typically have on hand or can ask patrons to bring in to upcycle (toilet paper and paper towel rolls, clean soda cans, clean milk bottles, etc.). Make flyers and mix the fandoms, have some fun snacks and a laptop or tablet for reference. For the past few years, DK Publishing has been the driving force behind Star Wars Reads Day. It is held in October, and dates haven’t been set for 2016 as of yet, but 2016 will be the 5th anniversary. I can’t imagine they wouldn’t have the event this year as it’s grown every year and had a huge response. To see what was available for 2015, click here. Having thrown SWRD since its inception, I can tell you that every year it has been a huge hit with tweens and teens. It’s also another excellent opportunity to ask your local 501st to come out, but ask early through the website as they get inundated with requests. Teen Read Week has been moved the week of October 9th this year; as of the date of this post the theme for 2016 hasn’t been released. Put little Yodas around with Read You Must signs, along with other fun signs advertising your events. ALA currently has posters available in the Star Wars theme featuring Origami Yoda characters, R2D2 and C3P0, and a Stormtrooper; we can hope they can make a deal with Disney to create new posters. 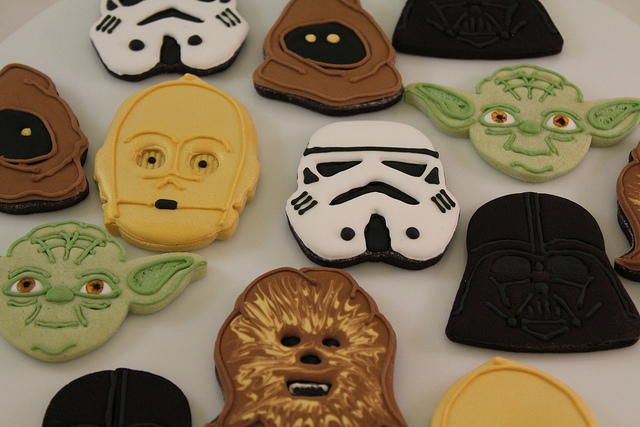 October is National Wookie, ooops, Cookie Month: have a cookie decorating party by getting pre-made sugar cookies in the shapes of Star Wars characters (or even circles for BB8 and human faces or icons), and have icing available for tweens and teens to decorate their cookie as their favorite character or icon. Local bakeries I’ve found are typically more than willing to work with you with ample notice, sometimes giving breaks on prices or even a small amount for free in exchange for advertisement. International Games Day is the third Saturday in November, and it is a wonderful time to highlight the importance of gaming in libraries, and what teens and tweens can learn from games. Keep an eye on the site to register, as registered libraries often receive free things from official sponsors. An easy self-directed program would be to reserve space for game players and a few board games, while a more detailed program would be to get a copy of Star Wars: Armada and teach teens and tweens the rules and play a round or three. I’ve done many an IGD and we’ve had a ton of fun playing a wide variety of games. It can be as easy or as intricate as you want to make it. Aviation History Month: Star Wars owes a lot to the history of aviation and the military that we have here on “Terra.” Call in a local expert on aviation to showcase the history and details, and then bring together worksheets to point out how Star Wars tech models and imitates our aviation rules. Additionally, you could call in a history and/or military expert to talk about the parallels between Star Wars and Earth. For more information about it, take a look at From World War to Star Wars, the blog series by Cole Horton. National Election: This year marks the Presidential Election, so have the entire library vote for who they want to rule the universe: Vader/Palpatine; Han/Chewie; Finn/Rey; Poe/BB8. Create your own candidates, or find graphics online to highlight the campaign. Star Wars Snowflakes: Anthony Herrera, who has to be a genius, has created a yearly series of Star Wars cutout snowflakes along with directions. Following these directions will give you Star Wars patterned snowflakes, I kid you not. I’ve done these with my teens, and be prepared to make these all day with your teens because once they get started they get hooked. The 2015 collection is here. Amiguriami program: I know a lot of libraries that have had truly successful crochet/amiguriami programs, where they create little handheld characters. I have not gotten the hang of it yet but they are adorable. Check out the tutorial for BB-8 and tell me you wouldn’t need him. Rogue One Preview Party: Rogue One: A Star Wars Story is scheduled to be released on December 16, 2016. The first in the Star Wars Anthology series, and meant to stand alone within the Star Wars universe, it is going to tell the story of the Rebel spies who steal the plans for the first Death Star, which sets it before A New Hope. Hold a night-before viewing party with snacks, possibly a viewing of The Force Awakens depending on movie rights, and if you are really tight with your local theater and your library policies allow it, have a movie meet-up to see a midnight showing. So what things are you thinking of doing?